Just like any family, the Yukon is truly unique. 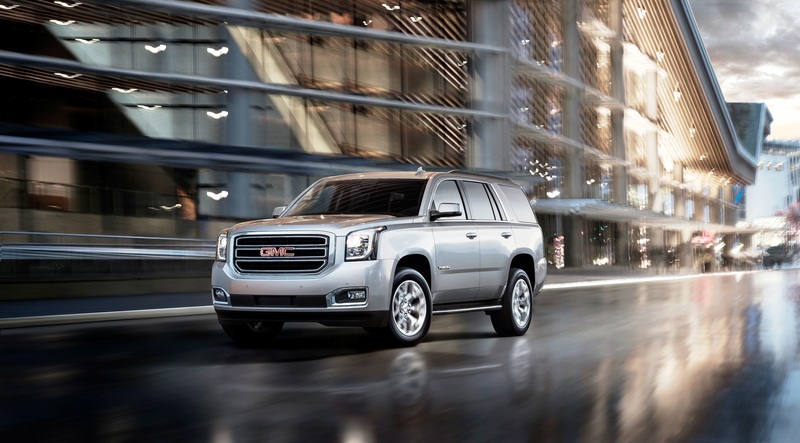 It is available across the Middle East in SLE base trim, SLT trim and the top-of-the-line, luxury Denali variant. And because prominent families need a big SUV for big adventures, there is also a Yukon XL version – a full-size extended-length model with superior capability and comfortable seating. Whether travelling across town on the school run or cross-country on a family road trip, there are six key family-focused reasons why the Yukon will be a hit for all passengers, large or small. Details make the difference when it comes to GMC design – and that’s especially true within Yukon’s interior. Thanks to the use of a wide variety of upscale materials, the Yukon’s interior is as stylish, sophisticated and inviting as its exterior. Ensuring it is as comfortable inside as it looks, standard tri-zone automatic climate controls allow the driver, front passengers and rear passengers to select their temperature settings. With different family members often sharing the driving, the Memory Seat feature makes swapping seats so much easier. Whether it be a mom, dad or even the older children behind the wheel, this feature allows multiple seats, steering column, and mirror settings to be stored and recalled at the push of a button. Whether carrying family and friends, sports equipment, luggage, or other cargo, the Yukon’s interior is as functional as it is stylish. With standard seating for eight passengers, there’s plenty of space. 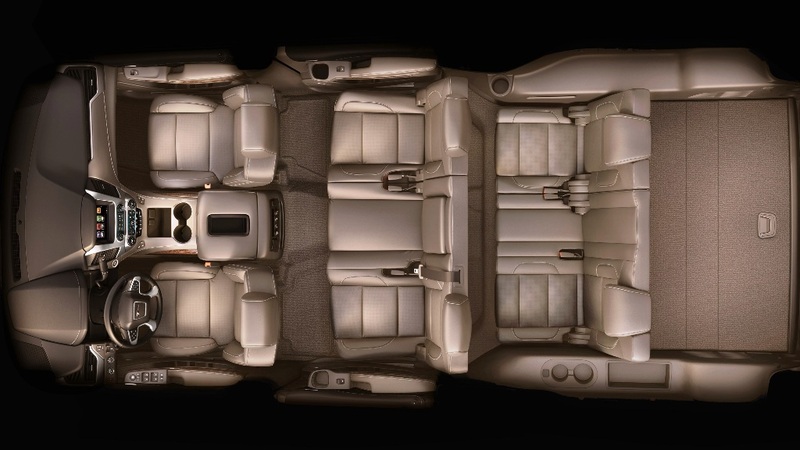 Yukon XL goes a step further, giving third-row passengers extra legroom. The 2019 GMC Yukon offers up to 2,681 litres – 3,446 litres in Yukon XL – of load space, with the second and third-row seats, effortlessly folding forward to form a flat load floor with a simple push of a button. The Yukon Denali can make loading or unloading cargo even more comfortable, thanks to its Hands-Free Power Programmable Rear Liftgate. By moving a foot underneath the rear bumper, the power liftgate can be opened or closed without the key fob. It can also be set to open at varying heights to avoid hitting low-hanging obstacles in a parking structure — all making life simpler in a variety of everyday scenarios. 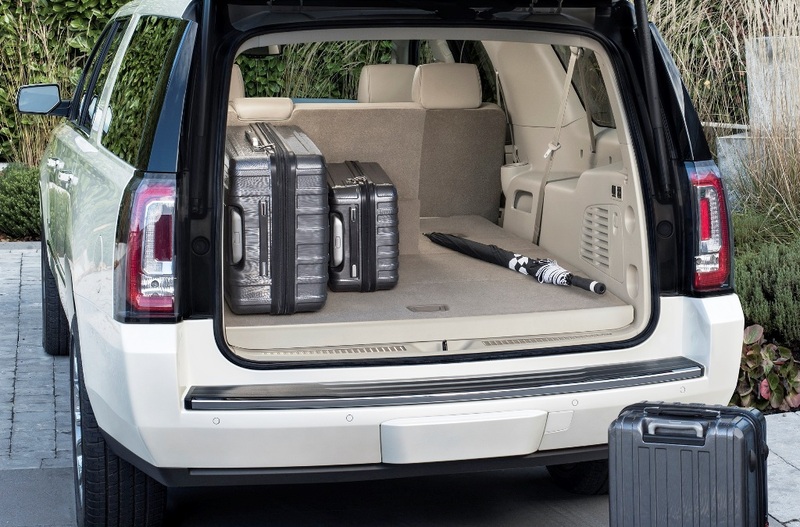 Yukon’s interior includes some cleverly-designed storage areas, perfect for stashing away all the various bits and pieces that come with a family on the go. Yukon’s centre console not only incorporates small cubbies within the front footwells but also provides a deep storage area beneath the armrest. Both front and rear door panels incorporate pockets and small shelves for neatly storing away personal items when not needed. The GMC Yukon’s Infotainment System’s 8-inch diagonal touch screen can slide up with the touch of a button, revealing yet another storage compartment in which to hide a smartphone or other mobile device from prying eyes and fingers. 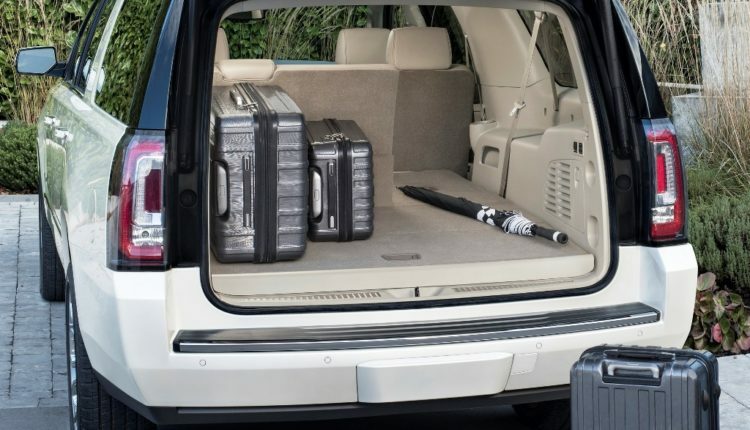 Yukon’s cargo hold also includes a standard under-floor cargo management system, which helps keep items organised and tidied away. Safety is paramount when it comes to transporting those people most precious to us. So, Yukon offers a wide array of safety features designed to not only to help protect passengers in case of a collision but to help drivers avoid one altogether actively. The Enhanced Driver Alert package, which is available on Yukon SLE and standard on Yukon SLT, and Yukon Denali, includes some active safety technologies, including IntelliBeam automated headlamp control, Forward Collision Alert, Low-Speed Forward Automatic Braking, Lane Keep Assist with Lane Departure Warning and Safety Alert Seat. Yukon Denali also offers a hi-tech Adaptive Cruise Control – Advanced system, which works in conjunction with the Forward Automatic Braking system to enhance regular cruise control with radar. Additionally, the Rear Cross Traffic Alert system on Yukon SLT and Yukon Denali provides alerts when the vehicle is in Reverse to help the driver avoid detected cross-traffic approaching from the left or right side of the car. 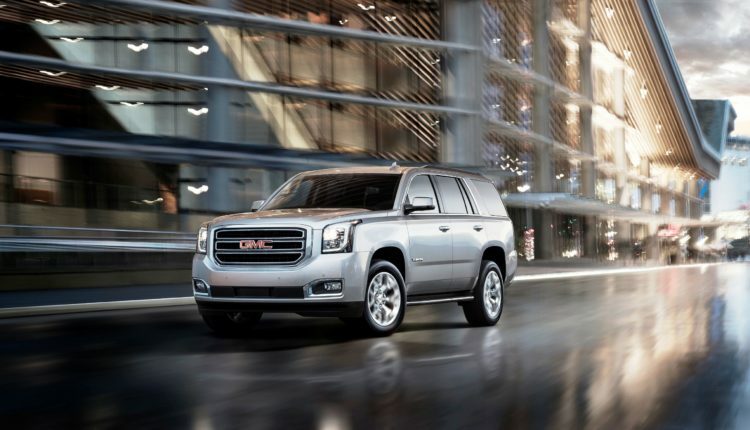 GMC’s Yukon offers a wide array of features to help the driver and passengers stay connected with the world around them at all times. Yukon’s standard GMC Infotainment system includes Apple CarPlay/ Android Auto compatibility, allowing drivers to leverage the power of their smartphone and select apps through voice commands and Yukon’s physical controls. Yukon also offers up to five 12-volt power outlets throughout the cabin (including some conveniently placed for a second- and third-row passengers), as well as up to seven USB ports, along with an available 220-volt outlet – essential for keeping children happy while they use their electronic devices. Yukon Denali also incorporates an inductive wireless charging pad within the centre console armrest that can charge select compatible devices. 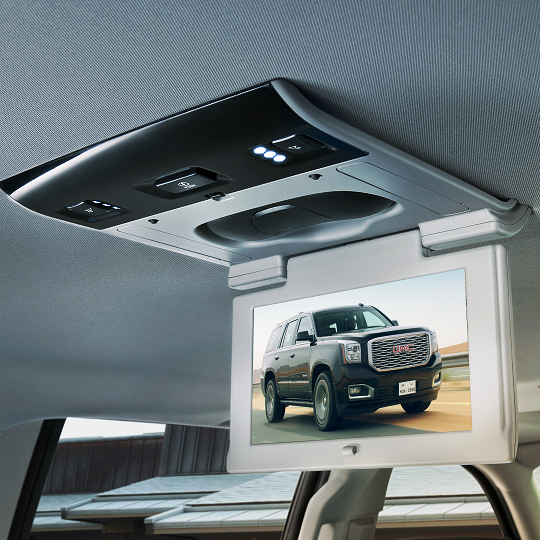 Yukon’s available rear-seat entertainment systems can keep passengers entertained for hours on end. 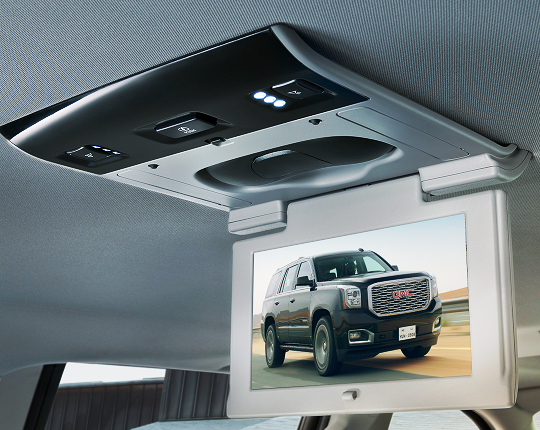 Available on Yukon SLT, and Yukon Denali, a BluRay/DVD system incorporates a 9.2” LCD (Yukon XL models offer a second screen), along with remote control and wireless headphones. The system also includes a pair of USB inputs and an HDMI input – ideal for use with a video game system.